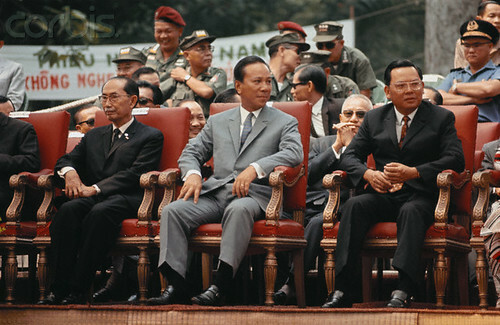 Giây phút tưởng nhớ Việt-Nam Cộng-Hòa. 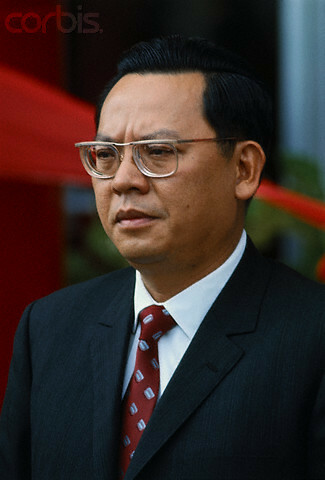 .Giây phút tưởng nhớ Việt-Nam Cộng-Hòa. 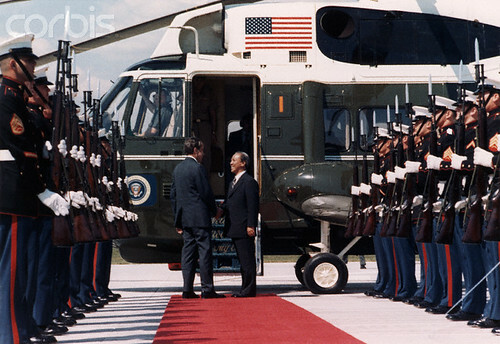 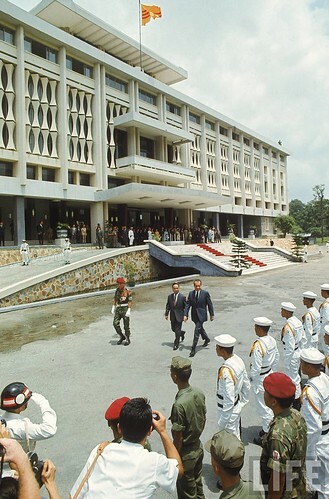 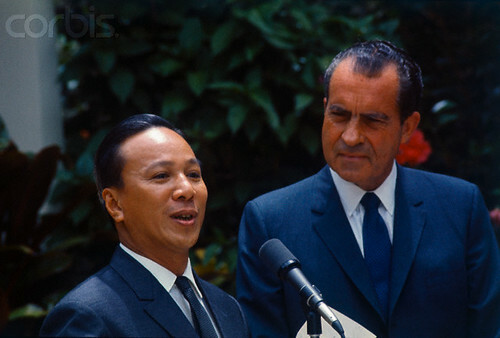 1969 (R-L) President Richard Nixon and Thieu Ky reviewing South Vietnamese naval personnel during Nixon's visit. 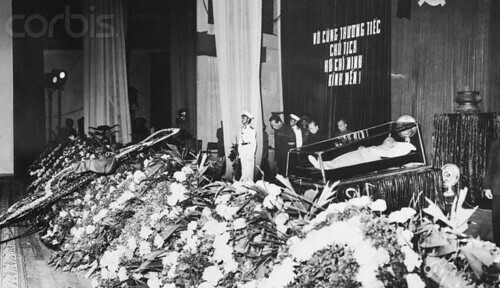 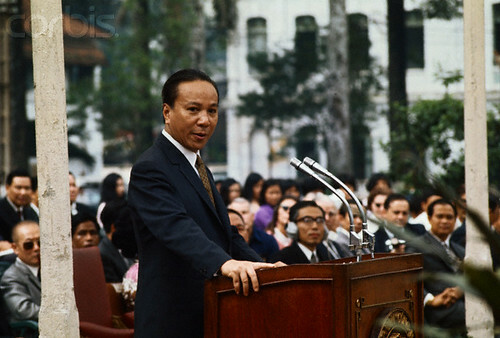 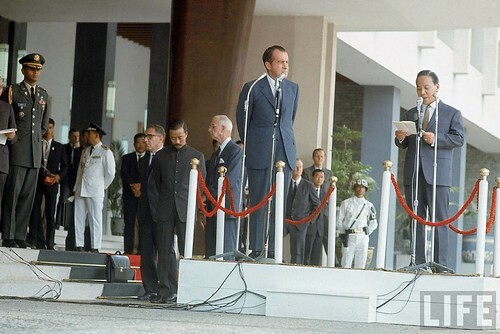 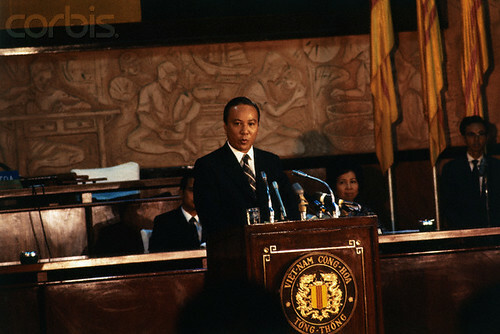 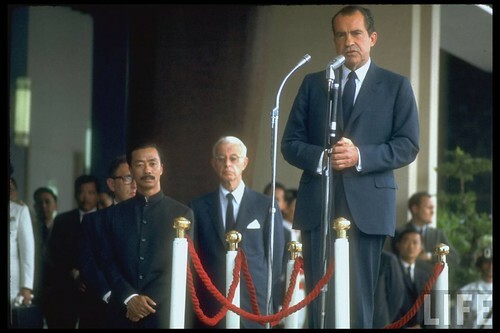 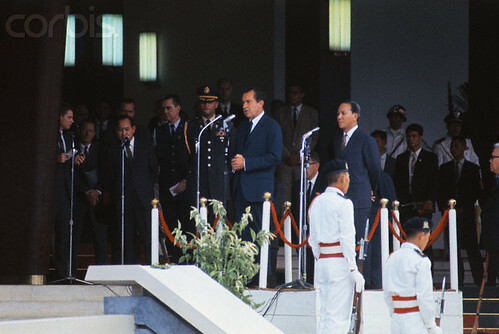 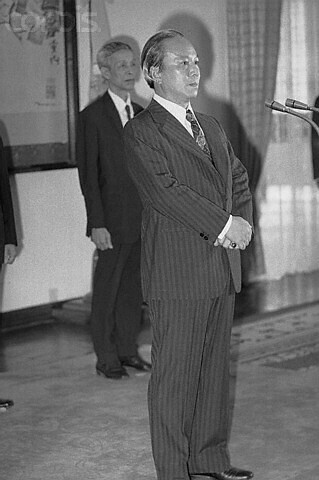 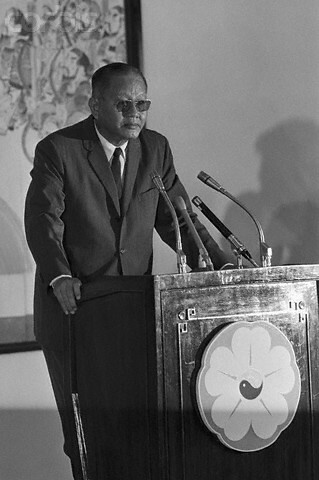 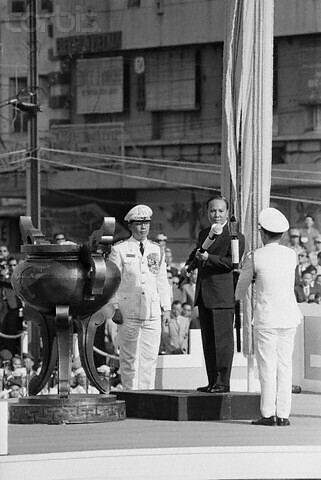 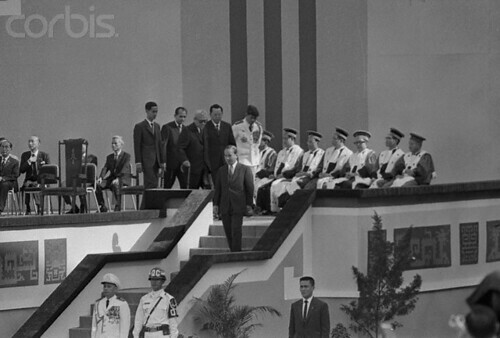 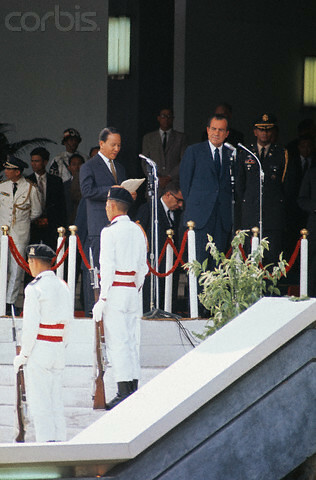 October 1971, Saigon, South Vietnam --- Saigon, South Vietnam: President Nguyen Van Thieu of South Vietnam giving a campaign address. 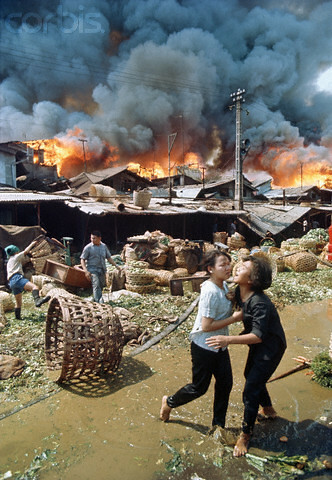 24 Jan 1971, Saigon, South Vietnam --- 1/24/1971-Saigon, Vietnam- Spectacular blaze looms in background as a Vietnamese woman is comforted by a companion and a youth (background) hastily stacks wicker baskets for removal. 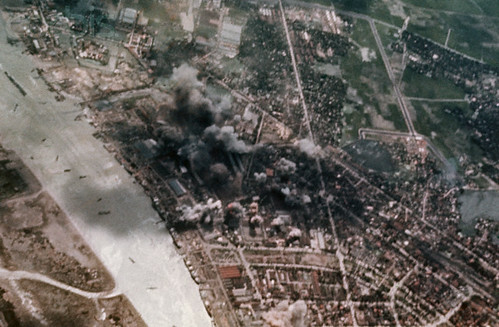 The blaze, the cause of which was not determined, erupted 1/24 in huge market area of fruit stands and vegetable stalls along the Saigon River. 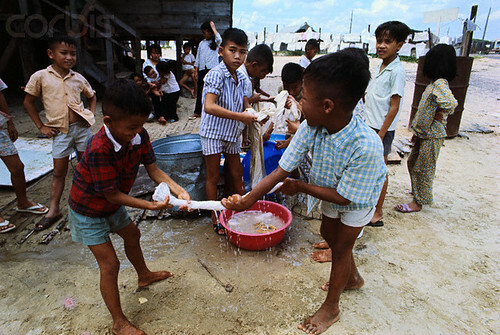 Fires are much feared here, as many of the houses and buildings are built close together and are constructed of straw, paper, light wood and other materials which have a propensity for burning quickly and easily. 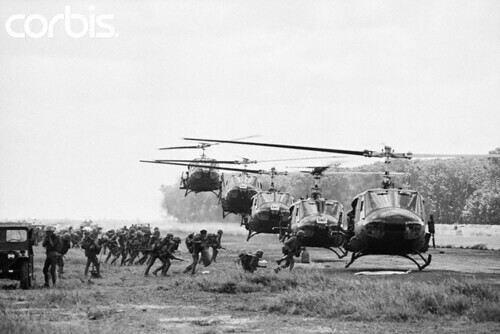 Filed 2/3/1971..
10 Apr 1972, Lai Khe, South Vietnam --- Holding Their Own. 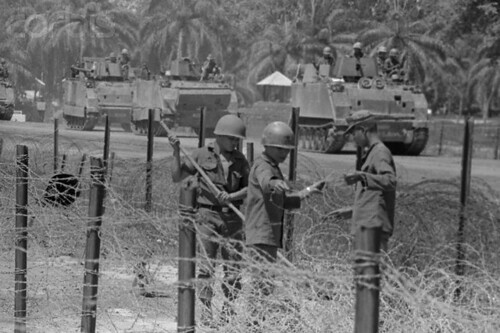 South Vietnamese soldiers string barbed wire along road as armored personnel carriers, of elite South Vietnamese paratrooper division, move along Highway 13 toward embattled city of An Loe some 60-miles north of Saigon here April 10. 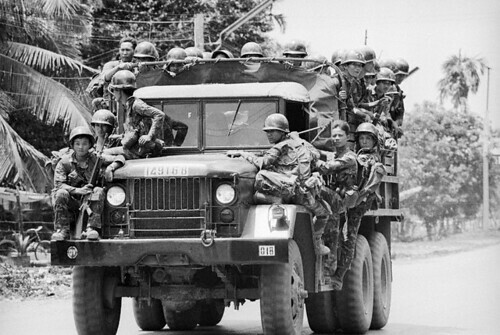 U.S. Maj. Gen.. James F. Hollingsworth, senior military advisor in 11 province area surrounding Saigon, reported the Communist thrust down Highway 13 toward Saigon had been halted. 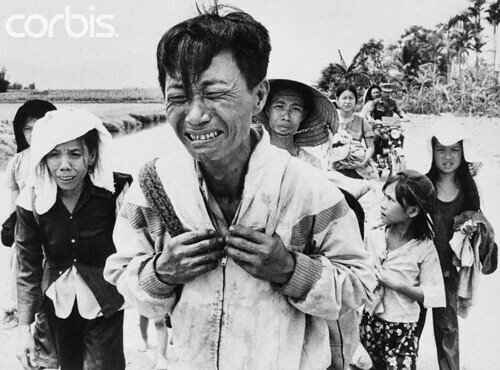 16 Apr 1972, An Loc, Vietnam --- Victims of Battle for an Loc. 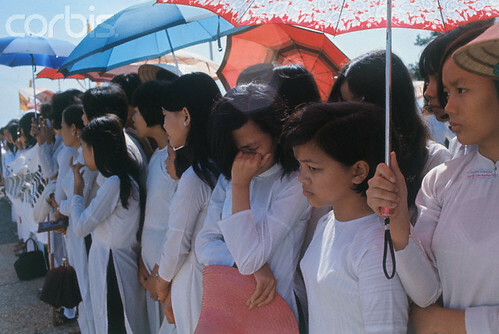 An Loc: Bodies of ARVN soldiers lay where they were slain April 14, during intense battle for this provincial capital some 65 miles north of Saigon. 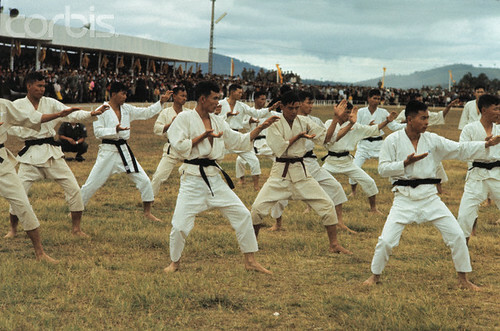 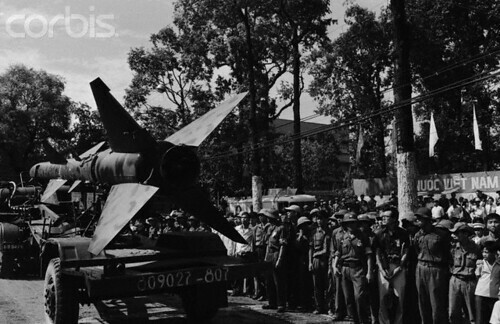 North Vietnamese troops have vowed to capture the town and make it a provisional capital for the Viet Cong. 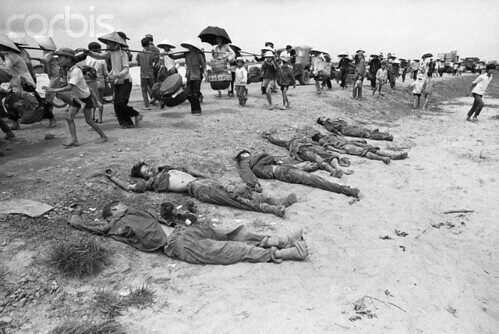 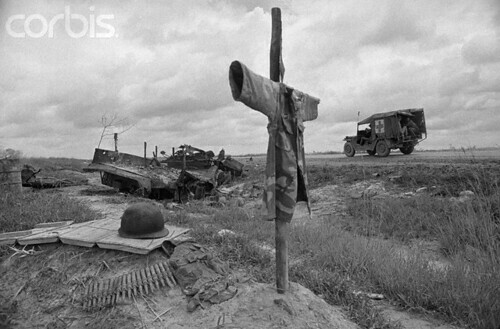 06 Apr 1972, Quang Tri City, South Vietnam --- 4/6/1972-Quang Tri City, South Vietnam- Dead North Vietnamese soldiers are lined up beside road as refugees from Quang Tri City City flee from fighting, 4/5, five miles south of Quang Tri. 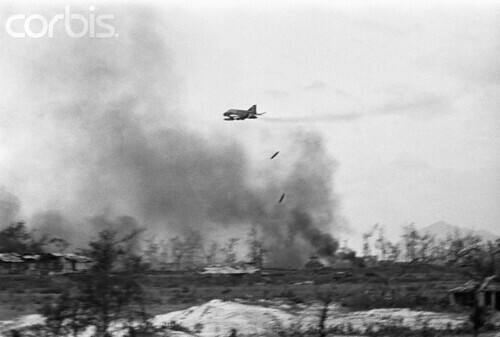 17 May 1972, Haiphong, North Vietnam --- A US jet bombs warehouses and shipping areas in Hiaphong, Vietnam. 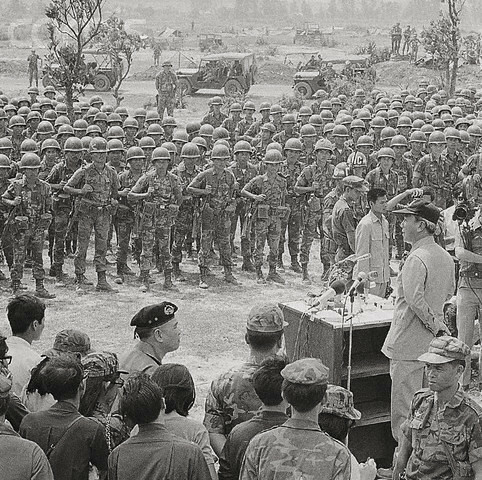 18 May 1972, Hue, South Vietnam --- Inspection. 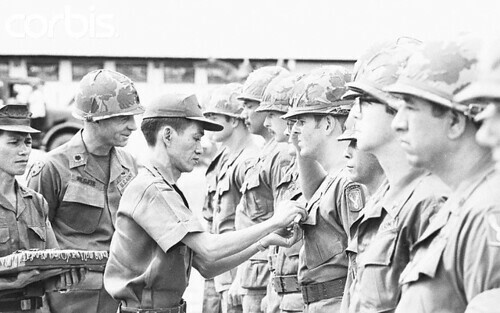 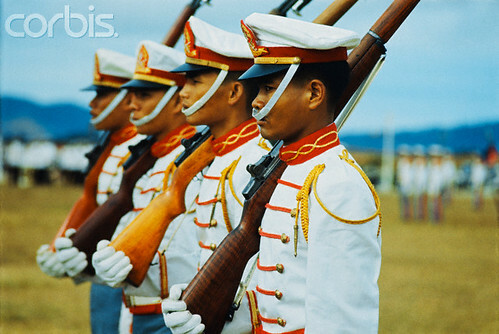 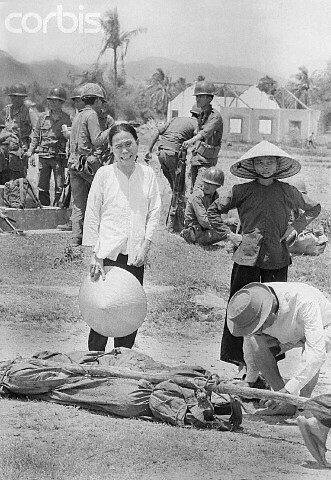 Hue, Vietnam: Newly installed Commanding General of the South Vietnamese forces defending Hue, Lt. Gen. Ngo Quang Truong, inspects soldier's weapons as U..S. advisor Maj. Gen. Frederick Kroesen looks on here May 17th. 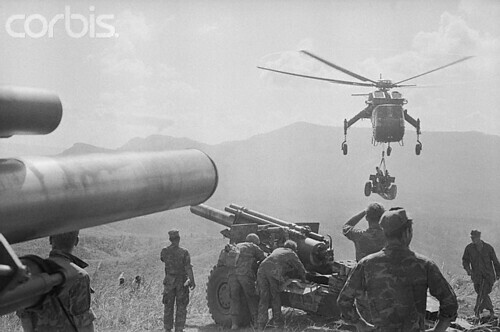 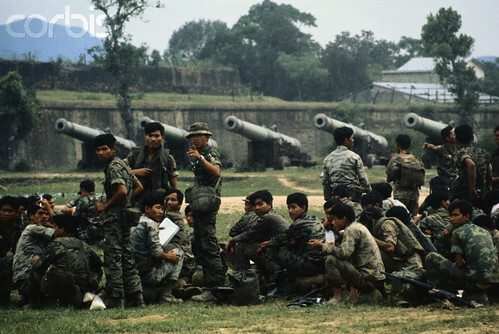 Some 900 government troops of 2nd Division were airlifted into artillery base Rakkasan, 15 miles West of Hue, to form what commanders called a "circle of steel" to protect the once imperial capital. 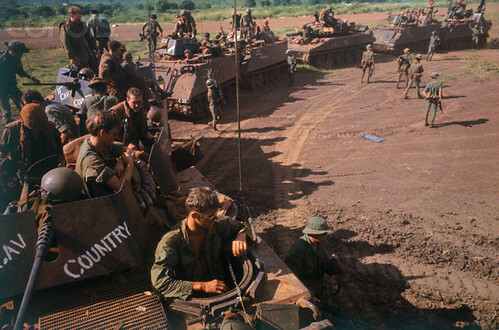 1 Aug 1972, Thang Binh, South Vietnam --- Thang Binh, South Vietnam. 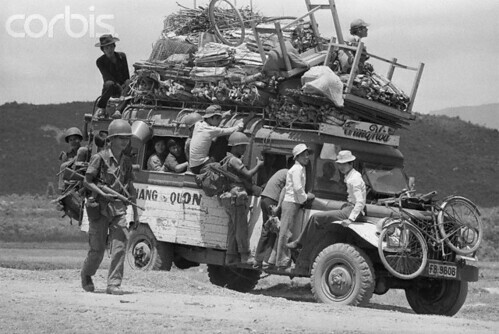 A bus bound for Da Nang is ready for departure, loaded with fleeing refugees and their persinal belongings..
22 Mar 1973, Hanoi, North Vietnam --- Hanoi. 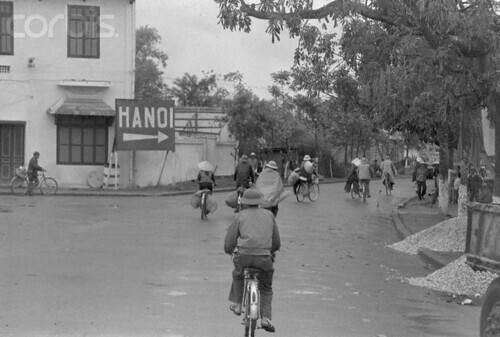 Younger member of family uses bicycle to transport his grandfather down town from outskirts of city. 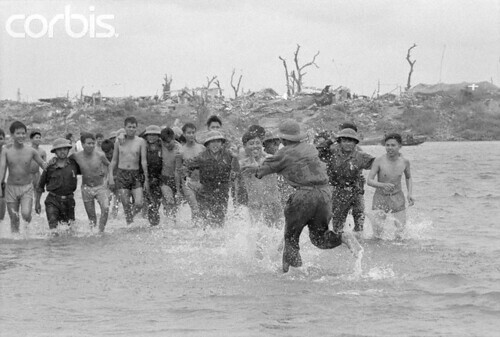 the old men was enchanted by foreigners taking his picture. 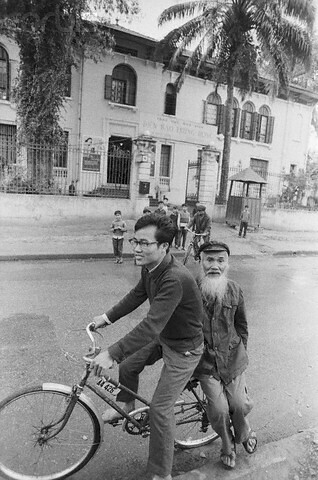 he got off the bicycle, stared a bit and then smiled and waved. 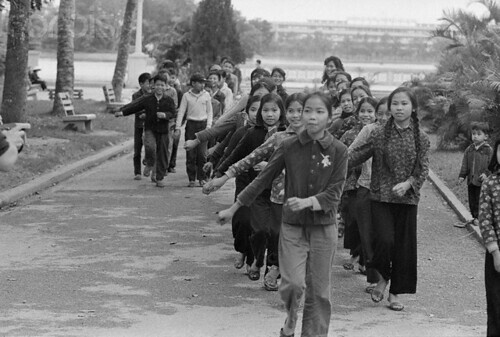 anoi, North Vietnam --- HANOI: Children run and play in front of a huge anti-American mural in a downtown Hanoi street March 29, the day when the last U..S. POWs were released. 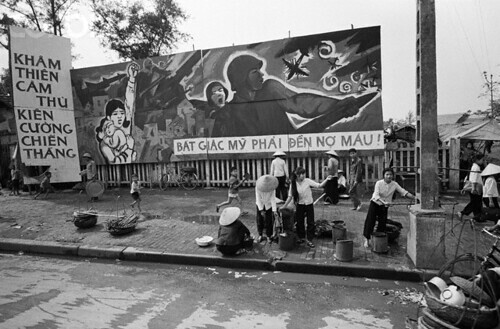 Banner across bottom of mural reads, "make the American aggressors pay in blood." 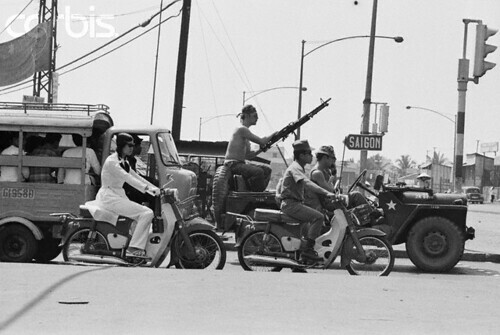 31 Jan 1973, Tay Ninh, South Vietnam --- 1/31/1973-Tay Ninh, South Vietnam- The contrast between war and peace is evident as members of a South Vietnamese mechanized unit watch people pass by on Highway 1 near Tay Ninh recently (Jauary 20). 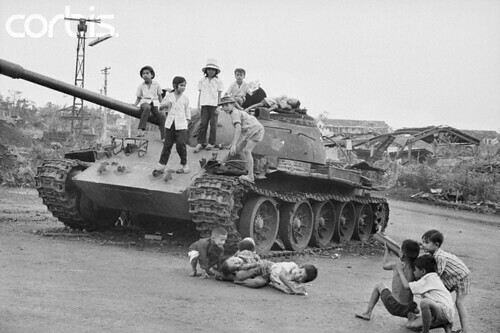 Even with the cease-fire in effect for more than 48 hours January 29th, widespread fighting continued. 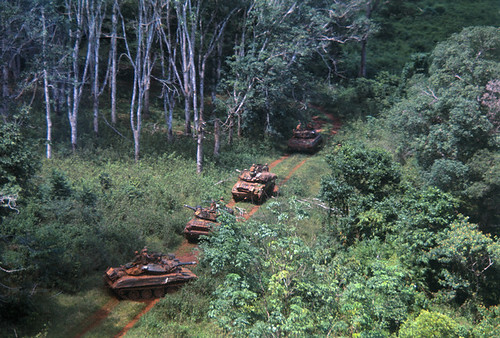 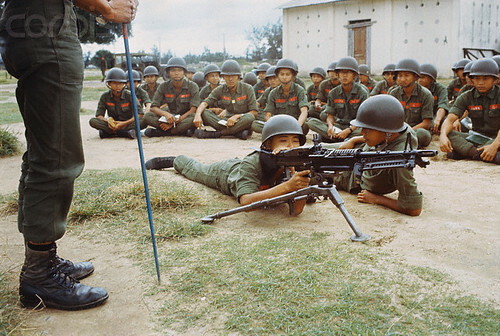 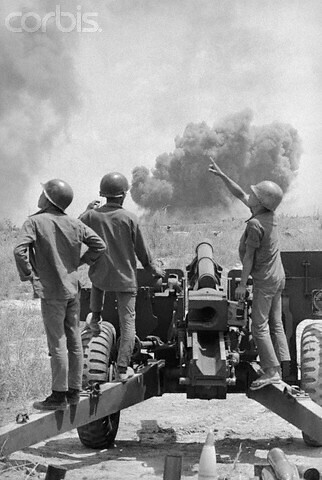 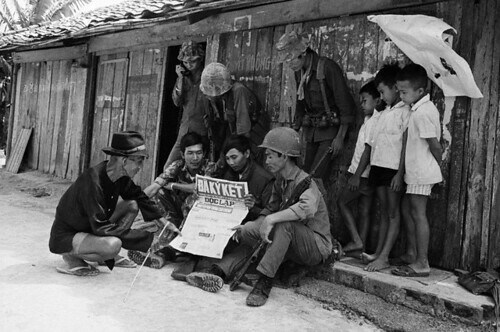 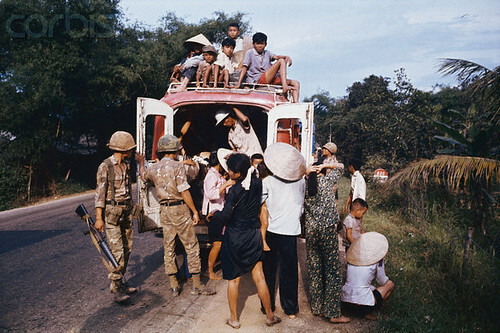 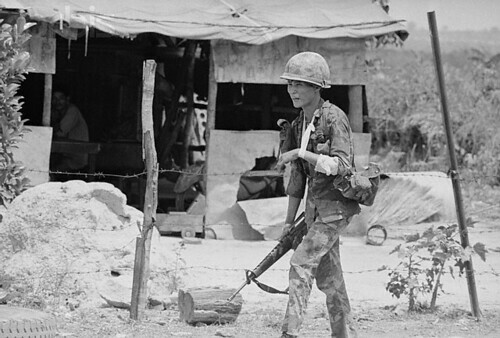 The South Vietnamese government reported 480 Communist truce violations. 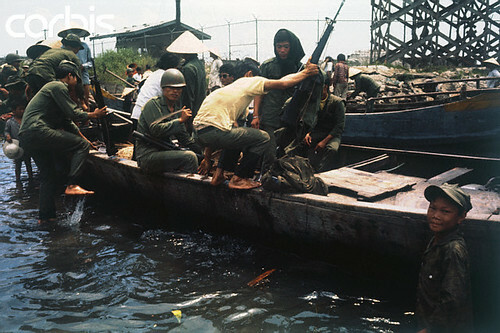 9 Mar 1973, Quang Tri, Vietnam --- Tha Chi Han river, near Quang Tri, Vietnam, North Vietnamese prisoners of war race to freedom across the Tha Ch Han River after being set free by the South Vietnamese in a one sided 500 man release 3/8. 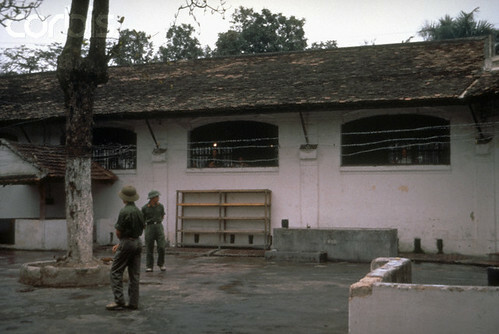 The release broke a long deadlock over POW's and when POW's would be released in the future and which jeopardized the further release of U.S. POWs from Hanoi. 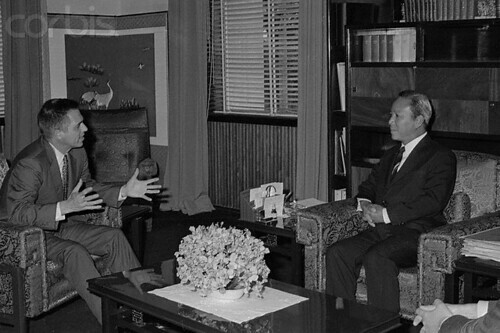 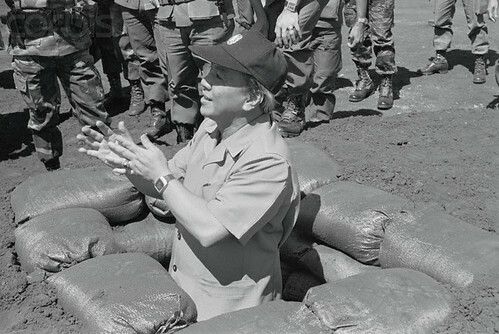 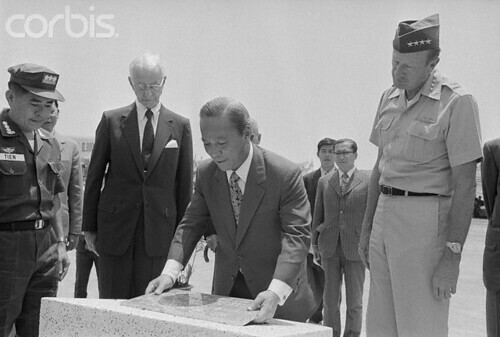 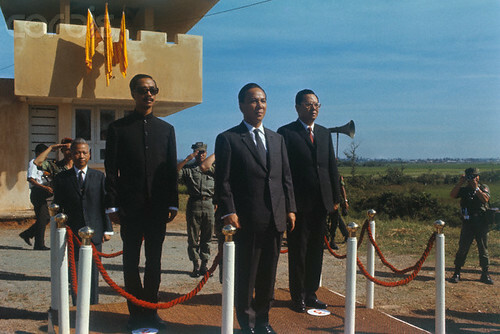 3 tháng trước khi miền nam mất nước :( 08 Feb 1975, Hue, South Vietnam --- President Nguyen Van Thieu visited Government posts around the old Imperial city of Hue and Danag 2/6 and later personally inspected a foxhole at the 1st corps marine headquarters here. 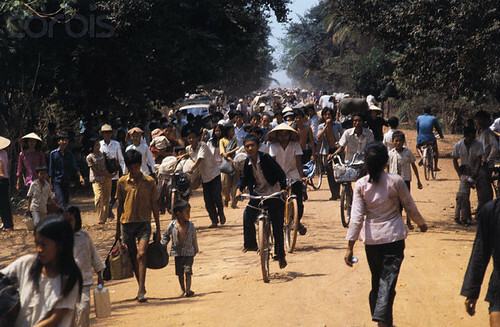 19 Mar 1975, Dau Tieng, South Vietnam --- Villagers flee down highway as Communists advance in Dau Tieng, 35 miles north of Saigon. 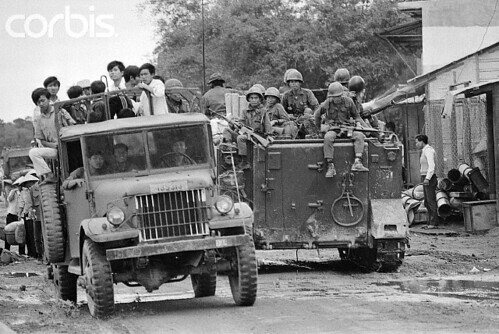 Blown-up bridges blocked 3/19 the escape route for a convoy of an estimated 250,000 persons from Pleiku and other towns in the central highlands, abandoned at the order 3/18 of South Vietnamese President Nguyen Van Thieu. 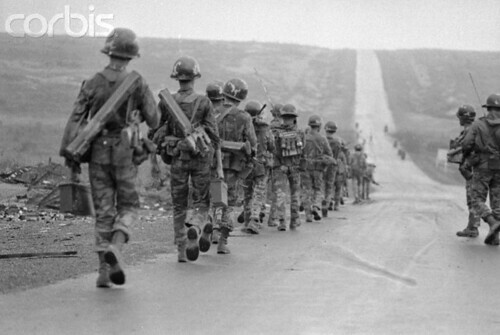 29 Mar 1975, Van Ninh, South Vietnam --- March 29, 1975 - Van Ninh, South Vietnam: Carrying only a few things on his back, a weeping head of a family leads the way while walking along Highway 1, twenty seven miles north of Nha Trang as they approach this town walking from Qui Nhon. 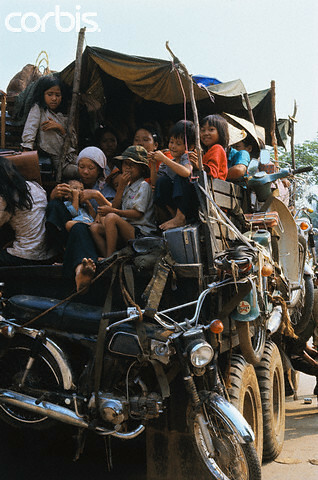 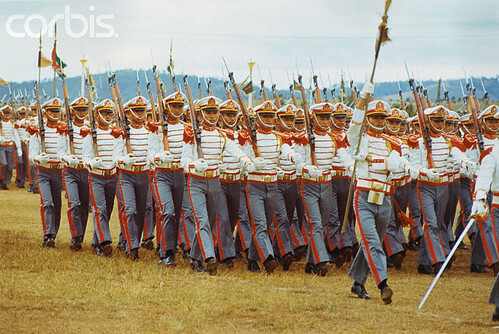 They are part of the Convoy of Tears from the abandoned Central Highlands. 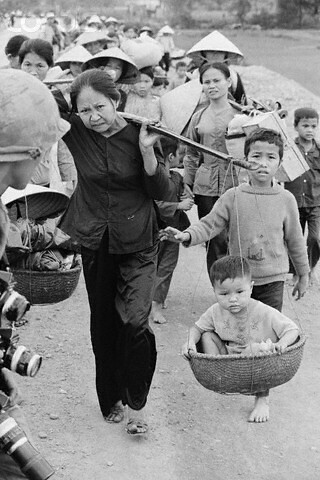 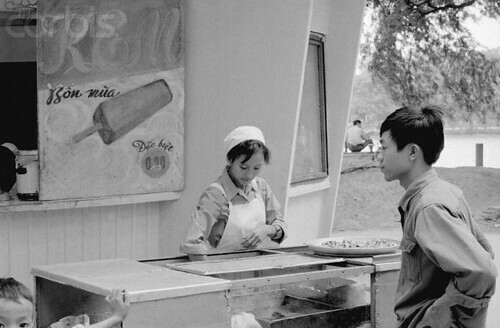 An estimated 1.5 million persons are feared trapped in Da Nang, which went under Communist control. 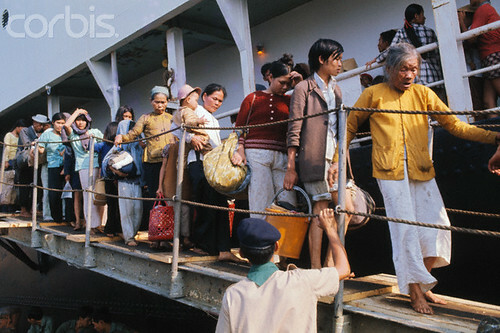 30 Mar 1975, Cam Ranh Bay, South Vietnam --- The ship unloads refugees from Da Nang at the dock here 3/29. 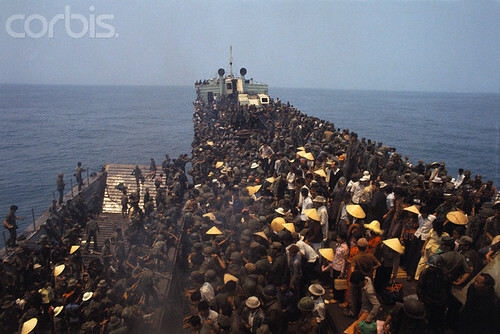 The American ship evacuated some 5,000 persons including some American Consulate personnel. 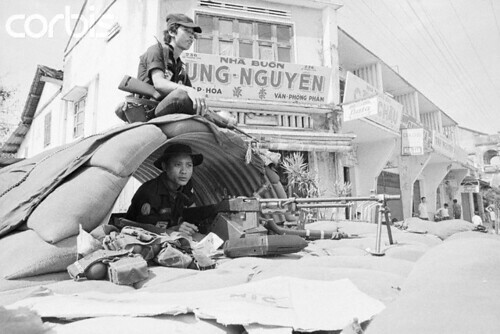 Military sources said 3/30 that North Vietnamese tanks were cruising the streets of Da Nang and that their flag was flying atop the American Consulate. 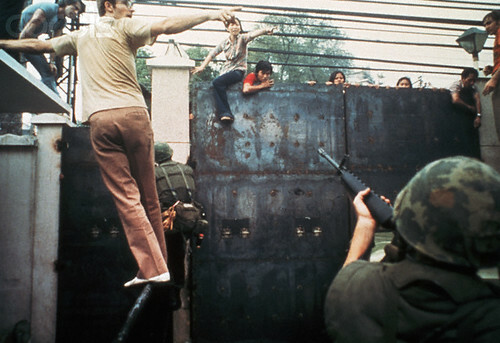 975, Saigon, South Vietnam --- Soldiers stopping people in the crowded street from climbing over the walls of the United States Embassy in Saigon, South Vietnam. 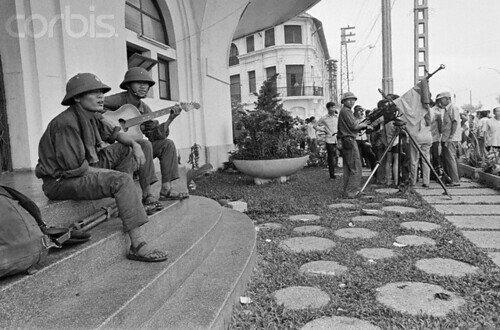 9 Apr 1975, Saigon, South Vietnam --- A CIA employee (probably O.B. 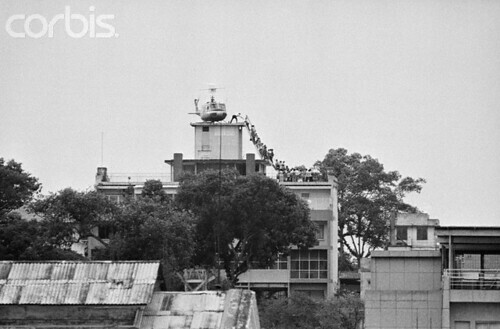 Harnage) helps Vietnamese evacuees onto an Air America helicopter from the top of 22 Gia Long Street, a half mile from the U.S. Embassy. 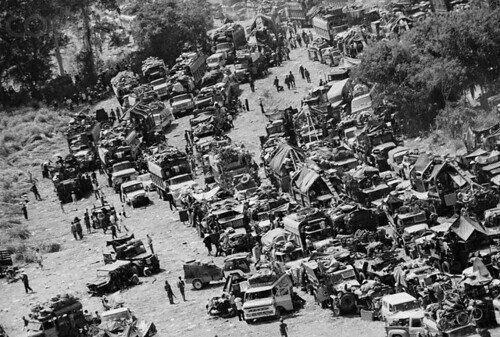 27 Mar 1973, Da Nang, South Vietnam --- March 27, 1973 - Da Nang, South Vietnam: This aerial view taken from one of the refugee planes as it flew toward Nha Trang airbase shows the crowds of people and boats milling around the dock here. 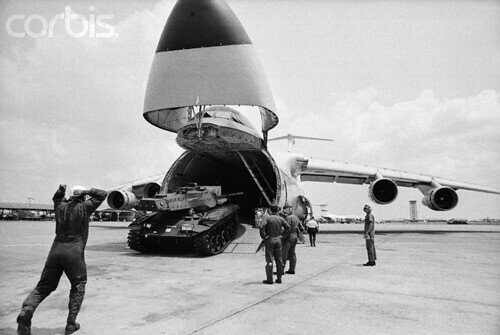 U.S. planes and pilots are flying 727s loaded with refugees to safer ground in Nha Trang. 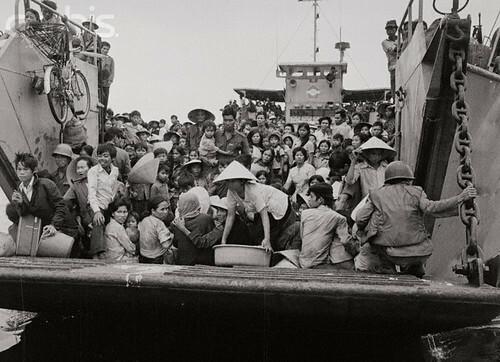 24 Mar 1975, Danang, South Vietnam --- A South Vietnamese Navy landing craft fully loaded with refugees from hue, 370 miles northeast of Saigon, ferry additional numbers of people to Danang 3/23. 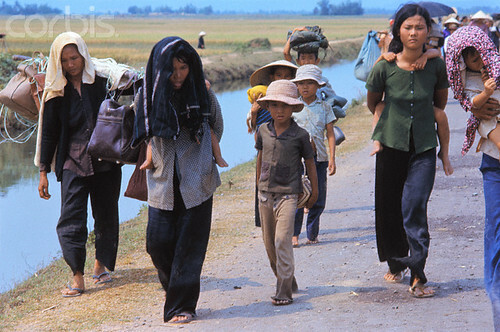 The 300,000 refugees already in Danang city will be disseminated in the vast land in the mekong delta with the help of foreign Navy ships. 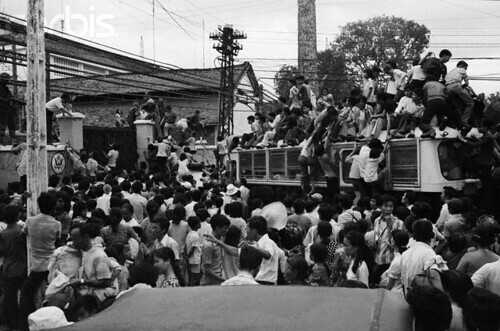 04 Apr 1975, Saigon, South Vietnam --- Refugees from Da Nang, Hue and other fallen South Vietnam cities, crowded with their belongings aboard buses, reach out for food and water as they head toward Saigon from Cam Ranh City. 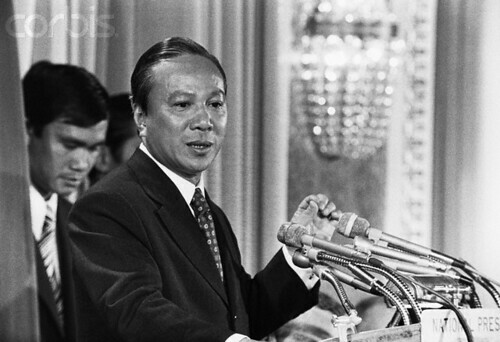 20th century --- Nguyen Van Thieu speaks behind a bank of microphones. 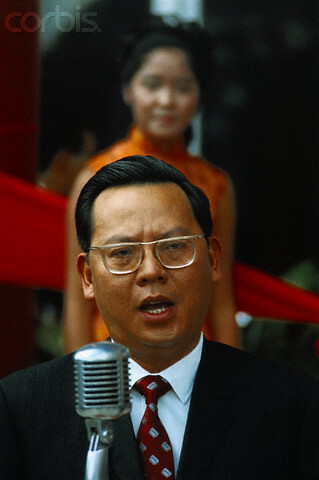 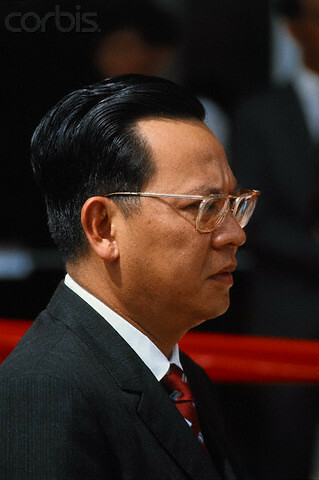 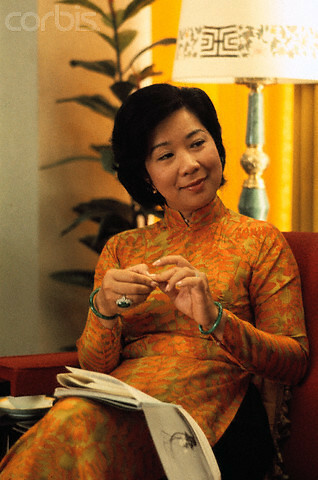 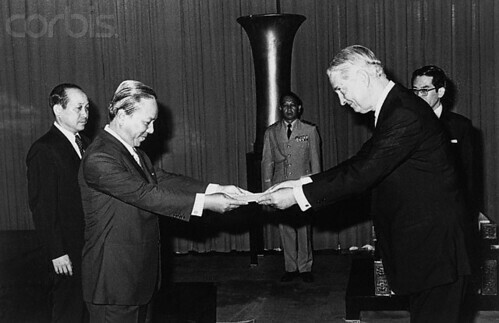 Thieu was the president of the Republic of Vietnam from 1967 until 1975, when North Vietnam took control. 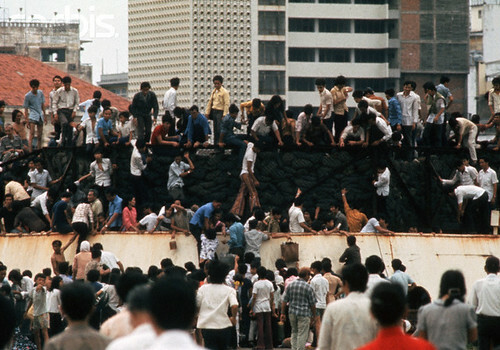 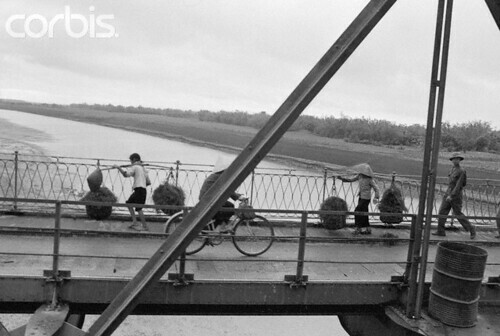 April 1975, Saigon, South Vietnam --- Refugees pour over fences at the port in an attempt to flee Saigon, South Vietnam. 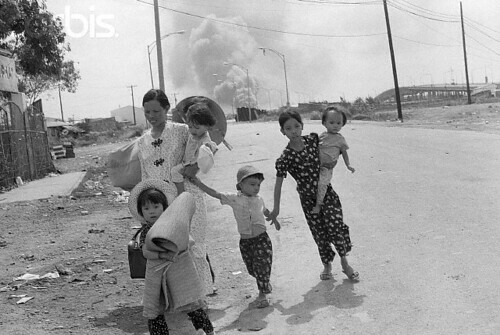 Saigon, South Vietnam --- Women and children run from the road as the (USAID) compound burns in the background on the northern edge of the capital. 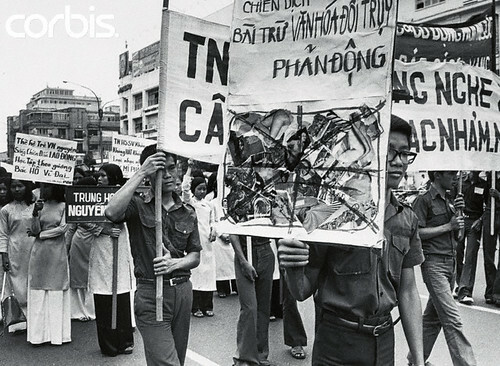 Communist gunners tightened the noose on Saigon 4/28 on three sides and within 5-miles of Saigon blocking Highway 1, in and out of here. 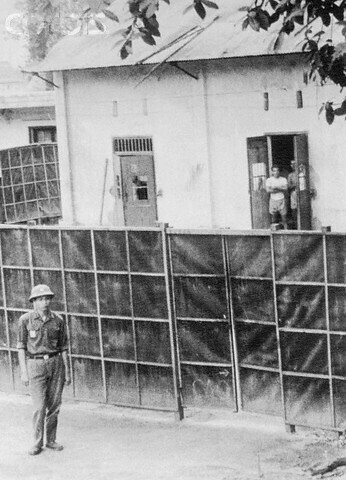 VietCong commandos were holed up near this compound, government troops were unable to oust the dug-in guerrillas.. 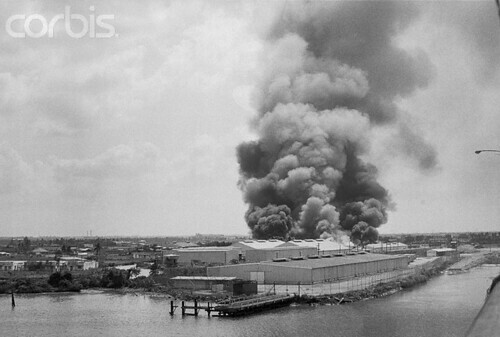 Most of the compound was burned in the fighting. 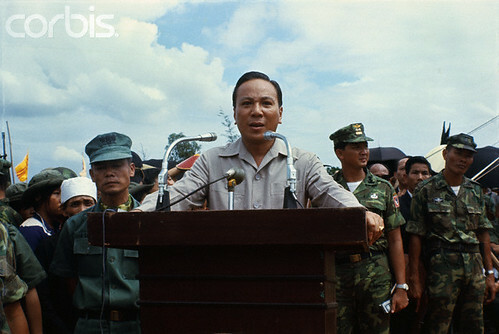 05 May 1975, Guam --- Guam: Former South Vietnamese Vice President Nguyen Cao Ky holds a press conference in a Guam refugee camp. 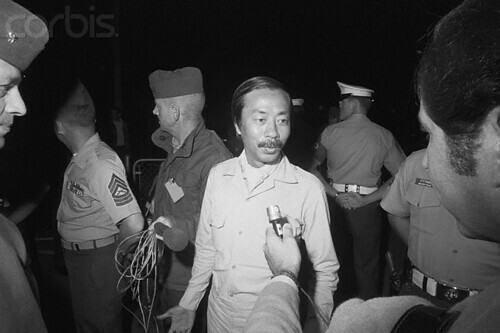 06 May 1975, El Toro Mas, California, USA --- El Toro Mas, California: Former South Vietnam Vice President Nguyen Cao Ky talks with newsmen after his arrival on the U..S. mainland with a group of other refugees aboard a military transport plane from Guam and Honolulu. 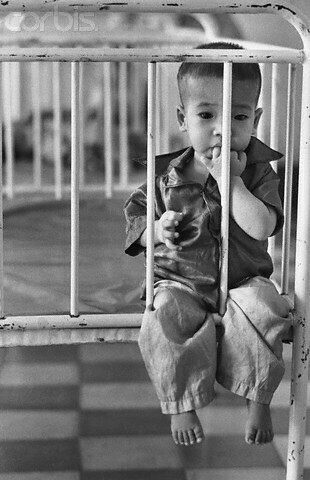 Asked if he wanted to become a U.S.. citizen Ky replied that it was too soon to decide, "I just want 48 hours of sleep. 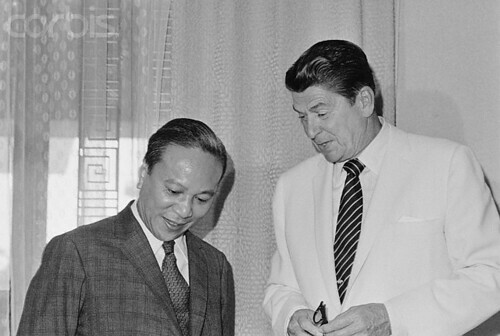 0 May 1975, Fairfax, Virginia, USA --- Nguyen Cao Ky, former premier of South Vietnam, sits on the floor of his new home in this Washington suburb and watches his sisters, Hoo (left) and Hieu, occupied with their needlework. 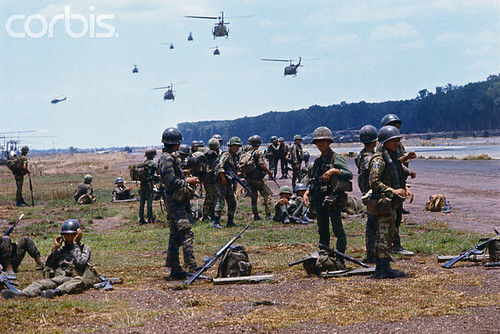 The house is devoid of furniture except for carpeting and a few chairs. 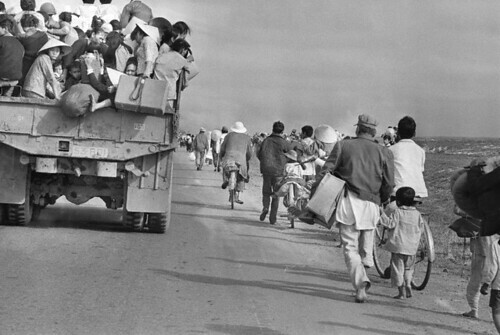 Ky's wife and six children and some other relatives are living with him. 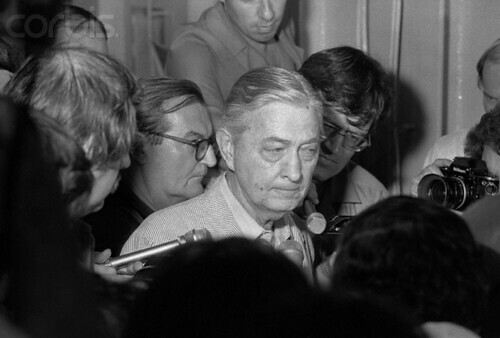 01 May 1975, HongKong --- US Ambassador to South Vietnam shows grim face as he surrounded by press men on the USS Blue Ridge in the South China Sea, 4/30. 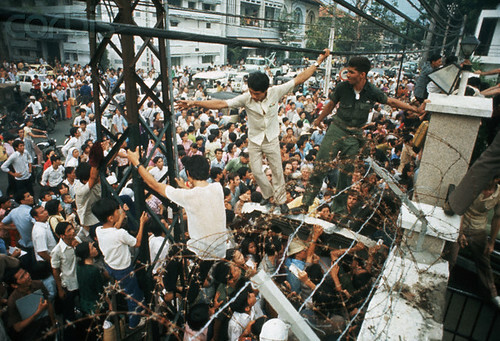 He abandoned the US embassy in Saigon just before the Saigon government surrendered to the Viet Cong and evacuated to the ship with other embassy staffers government surrendered to the Viet Cong and evacuated to the ship with other embassy staffers. 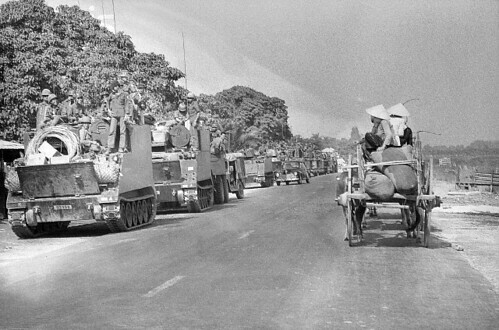 15 May 1975, Ho Chi Minh City, Vietnam --- The victorious North Vietnamese forces parade through the streets of Saigon. 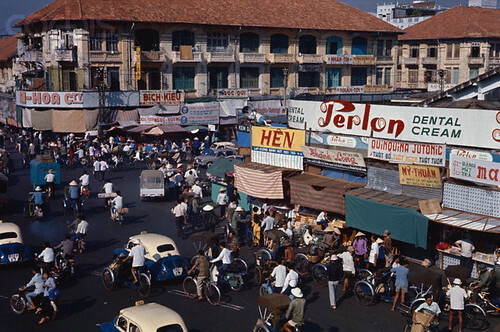 20 Jan 1970, Saigon, South Vietnam --- Saigon, South Vietnam: General view of people doing their pre-Tet shopping in the central market of Saigon is shown. 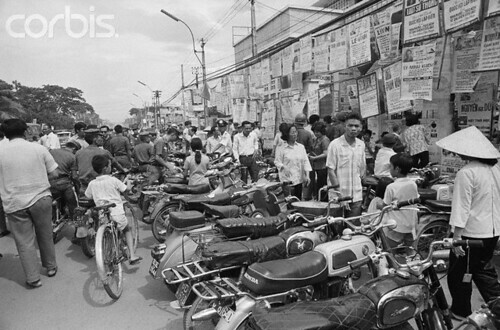 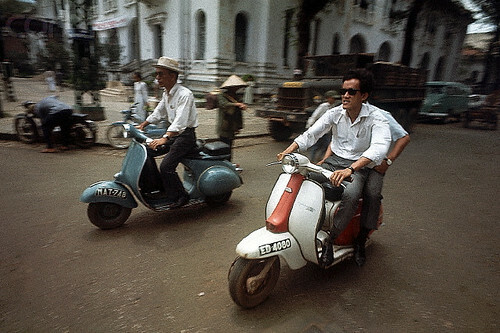 The Tet holiday in Vietnam is comparable to a combination of Christmas and New Year's. 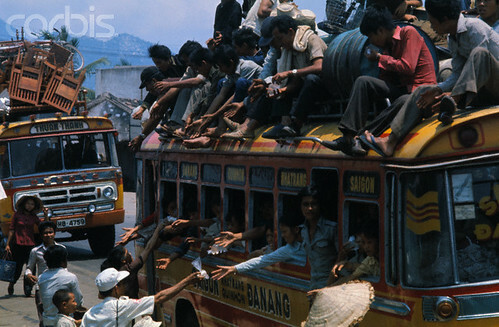 Hence, the big town scene is like the Christmas rush in Western cities. 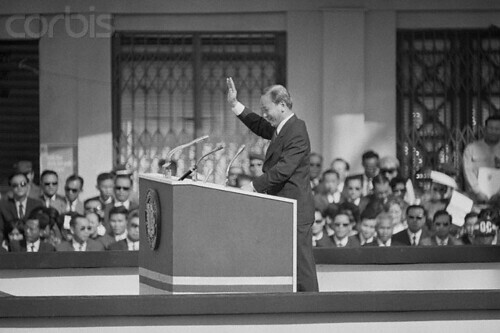 -nhìn lại hình thưở xưa, mới thấy Nguyễn cao kỳ đã có ý theo CS từ lúc phó tổng VNCH, tự mình đã chọn kiểu áo lãnh tụ Mao-Minh Hồ. 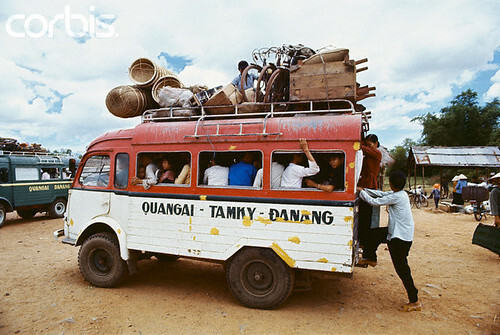 Có phải vậy không quí vị ?